Die cut is a process which the paper is die cut by cutter to be design shape. It is used on doing special shape on the cover, presentation folder, cards or package. In most cases, all the package should have die-cut process to make the package to be the final shape. The die cut process is before doing binding or before pasting the package. When the artist designs the package with special shape, the die cut artwork should be provided. You may do the die-cut artwork with any Pantone color to make the printer know it is for doing die cut. Because the artwork printing file is 2-D. To make the final 3-D package is exact shape as the design, for example, paper box, we recommend doing a sample to check the package shape before doing mass products. If the book cover or card with special shape, doing die cut sample is not necessary. 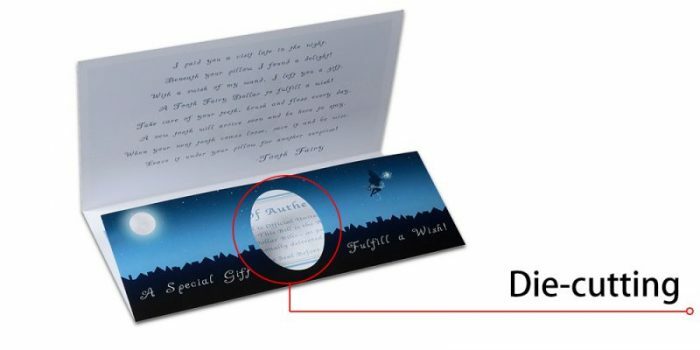 Besides package and special shape cover or card with die cutting, the thick paper folding line, perforate are also should be done with die cutting. Then the folding lines are straight. The final product looks neat. But you don’t need to provide the die cut artwork printing file. The printer can do it according to your request.